I didn't know this tools name is "Mill". This pepper mill is made by plastic, but there are many kinds of design for example woods and so on. I guess most people already know how to use this thing. Grasp the top and bottom parts and twist it, then crushed pepper will drop from the bottom of this tool. There is pepper seeds provided inside of this tool, and you can mill it when you want to use it while you're cooking, so it's really fresh and smells good. 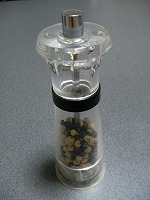 Before you're going to fry some chicken, it will become delicious if you use this pepper mill. 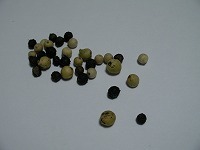 Inside of this kit, it looks little bit less of pepper seeds, but it will keep longer as I thought. Also you can refill it with buying pepper seeds in the supermarket. Let's use this tool and serve delicious foods.